Cameroon international hopes his form in the Scottish Premiership can earn him a recall for his country. 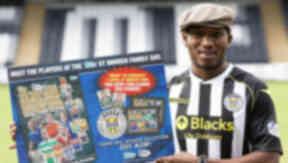 Eric Djemba-Djemba hopes that his surprise move to St Mirren can help propel him into the squad for the 2014 World Cup in Brazil. The Cameroon international arrived in Paisley after his contract at Partizan Belgrade was cancelled, and believes he can help lift Danny Lennon's side up the division. The 32-year-old was part of the Cameroon squad at the 2002 World Cup, and he has not yet given up hope of being on a flight to Brazil this summer. The former Nantes and Manchester United man said: "If I try to go to the World Cup it will be my second World Cup, because I was there in 2002. I will try to do my best on the pitch and bring my team up, so the national team of Cameroon will call me or will bring me." While Djemba-Djemba admits that he only has a passing knowledge of his new team, he is looking forward to getting started in Paisley. He said: "For me it was a great move, because the Scottish and English leagues are similar. For me it was a good move to come here and play again at a big club." "I know they won the League Cup last season, and they are playing in the Scottish Premier League and they have two experienced players who played in England. For me it's a big change to play here until the end of the season. Then we'll see what happens. "This club are very good with the young people, very good with family. For me, I understand it's big for this team. I will do everything I can to make them happy because they've given me a chance to come back to the big clubs. The midfielder also hopes that he can bring some of experience gathered from his time under Sir Alex Ferguson, when he makes his debut for St Mirren. He said: "For me it was a good team, it was difficult for me because after Roy Keane came back from injury it was difficult to play again. But I trained and played with fantastic players there: Paul Scholes, Ruud van Nistelrooy, Rio Ferdinand, Fabian Barthez. I took some experience, and now I need to take it to this team. "Roy Keane kicked everybody. He was a great man. Inside he was fantastic. "When the game was finished, when the training was finished, everything was behind him. He was very deep. Some people like wearing watches, he wasn't like that." Djemba-Djemba was speaking as St Mirren promoted the Topps special half term Family Day in conjunction with the club.